If you feel like you’re losing your hearing, it’s because you quite possibly are. In fact, more than six million people in the United States between the ages of 18 to 44 suffer from hearing loss. To tackle the problem, Fritz Lanman’s new company Doppler Labs is announcing Dubs Acoustic filters, otherwise known as extra fancy ear plugs. We wanted plugs that didn’t protrude out of your ears – making it embarrassing to wear at a club or a sports event – and didn’t get in the way of your listening experience, but we couldn’t find anything like that. So we decided to invent it. 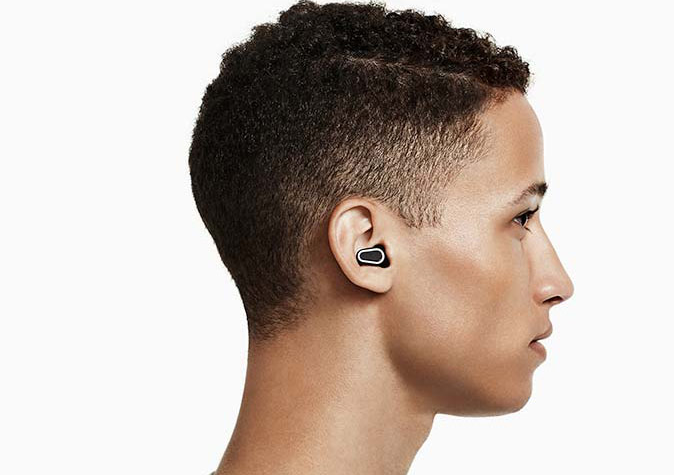 Dubs is the brain child of Lanman and co-founder and Doppler Labs CEO Noah Kraft. The idea here is that a totally mechanical device can be attractive, immersive, and improve the audio experience without sacrificing sound. The Dubs are built of 17 individual mechanical pieces (made from materials like steel, polymer foams and silicone) that reduce general volume by an average of 12 decibels. This allows you to go to something like Coachella, with fourteen hours of head-pounding music, without feeling like your ears are ringing for the next 48 hours. The Dubs do just that. They sit in the ear like a black little button, but aren’t visible when you’re facing the wearer head-on. But perhaps more impressive than the form or function is the price. To make Dubs accessible to all potential consumers (not just audiophiles, but folks who just walked into a concert), Doppler is pricing the product at $25, with availability starting now from Soul Cycle. Best Buy will also be selling the Dubs starting in November. As you might remember, Doppler Labs is one of two companies started by Fritz Lanman recently. Doppler Labs, in particular, is run by Kraft, Lanman and Dan Wiggins, with Dubs launching as its very first product. You can learn more about Dubs here.